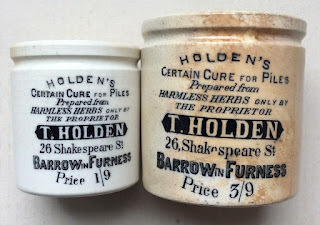 The Holden's pots carry an address of Shakespeare Street, Barrow in Furness but research to date has not been able to confirm when these pots were produced. Census records researched do not tie in a link to this address. Two price levels are known, unusual prices of 1/9 and 3/9. 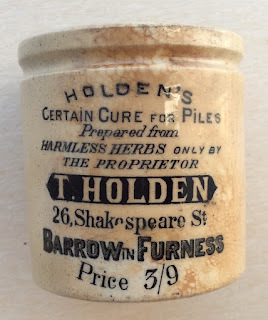 T. Holden, I am not aware of any sales at auction for these pots but one of the large size pots, the 3/9 size, changed hands for £400, see BBR magazine no. 76 for the article. 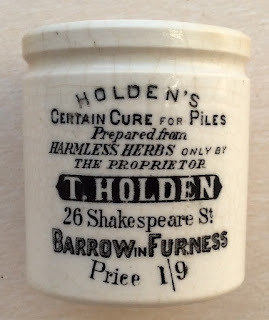 book produced by Messrs. Houghton & Priestley, page 77.